MMXnewscaster talked about the leaks of Micromax Canvas A111 and we covered it as promptly as we could and now it seems that every detail specified in the leaks were absolutely true and now it is available for the users to buy it at the price of 12,999 INR from Snapdeal (you will find the link to buy this phone at the end). We are just not sure about the frequency at which this Qualcomm 8255Q Quad Core processor has been clocked in the leaks it was mentioned to be 1.2 GHz but on the official page of Snapdeal where it is selling the device has not mentioned anything about this but the RAM usage is 512MB which was again specified in the leaks. The size of the screen is 5.3 inches and again the resolution of the display has not been mentioned. The primary camera of the phone is 8MP (also specified in the leaks) and the secondary camera is 0.3 MP. As the specs of this phone available from the leaks are almost same so we can conclude that the images of the phone are also real. The phone has a Dual SIM slot which will be using the GSM bands on both the slots. The Operating system used on this phone is Jellybean Android 4.1.2 and the internal storage capacity of this phone is 1.22 GB which can be extended up to 32 GB. There are few feature which are not mentioned about this phone as of now but they are important when a user wants to buy or compare the phones. So, we will go ahead and tell you about those specs which leaked initially (hoping that they will true like other parameters). The battery strength will be of 2100 mAh (which is really not good), the resolution of the display will be 960 x 540 pixel something adequate at such a price. 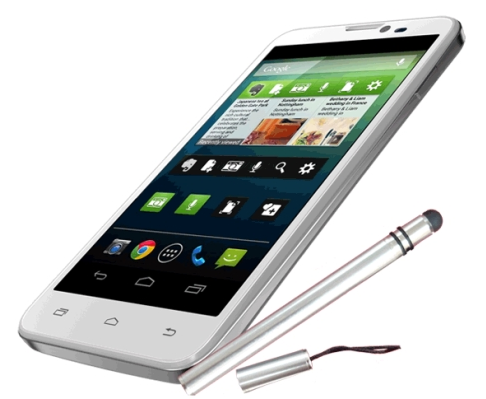 This phone gives the users with a great option to buy a Qualcomm Quad-Core phone at such a price. You can buy this phone by clicking here.